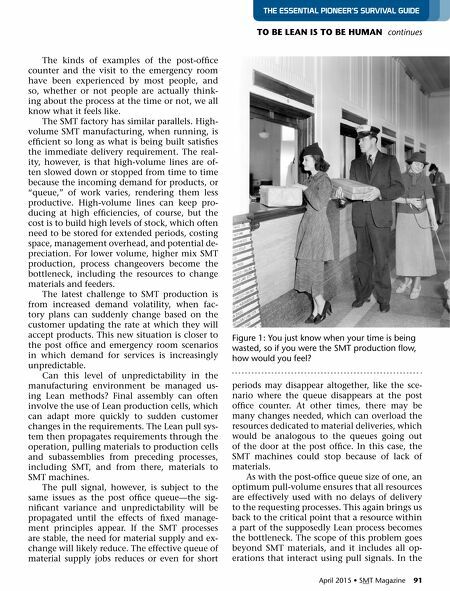 April 2015 • SMT Magazine 91 TO BE lEaN iS TO BE HuMaN continues the essentiAl Pioneer's surViVAl Guide The kinds of examples of the post-office counter and the visit to the emergency room have been experienced by most people, and so, whether or not people are actually think- ing about the process at the time or not, we all know what it feels like. The SMT factory has similar parallels. High- volume SMT manufacturing, when running, is efficient so long as what is being built satisfies the immediate delivery requirement. The real- ity, however, is that high-volume lines are of- ten slowed down or stopped from time to time because the incoming demand for products, or "queue," of work varies, rendering them less productive. High-volume lines can keep pro- ducing at high efficiencies, of course, but the cost is to build high levels of stock, which often need to be stored for extended periods, costing space, management overhead, and potential de- preciation. For lower volume, higher mix SMT production, process changeovers become the bottleneck, including the resources to change materials and feeders. The latest challenge to SMT production is from increased demand volatility, when fac- tory plans can suddenly change based on the customer updating the rate at which they will accept products. This new situation is closer to the post office and emergency room scenarios in which demand for services is increasingly unpredictable. Can this level of unpredictability in the manufacturing environment be managed us- ing Lean methods? Final assembly can often involve the use of Lean production cells, which can adapt more quickly to sudden customer changes in the requirements. The Lean pull sys- tem then propagates requirements through the operation, pulling materials to production cells and subassemblies from preceding processes, including SMT, and from there, materials to SMT machines. The pull signal, however, is subject to the same issues as the post office queue—the sig- nificant variance and unpredictability will be propagated until the effects of fixed manage- ment principles appear. If the SMT processes are stable, the need for material supply and ex- change will likely reduce. The effective queue of material supply jobs reduces or even for short periods may disappear altogether, like the sce- nario where the queue disappears at the post office counter. At other times, there may be many changes needed, which can overload the resources dedicated to material deliveries, which would be analogous to the queues going out of the door at the post office. In this case, the SMT machines could stop because of lack of materials. As with the post-office queue size of one, an optimum pull-volume ensures that all resources are effectively used with no delays of delivery to the requesting processes. 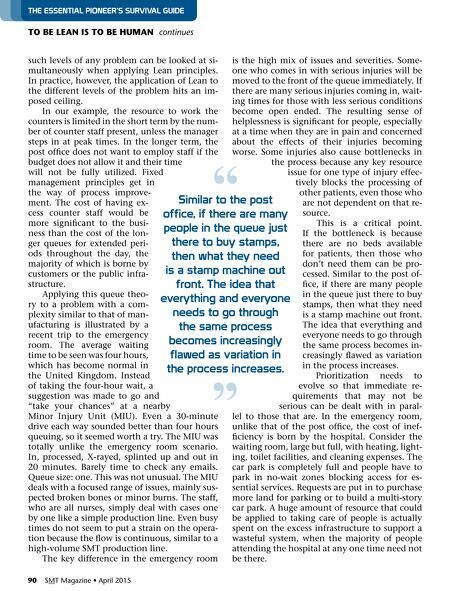 This again brings us back to the critical point that a resource within a part of the supposedly Lean process becomes the bottleneck. The scope of this problem goes beyond SMT materials, and it includes all op- erations that interact using pull signals. In the figure 1: you just know when your time is being wasted, so if you were the SMT production flow, how would you feel?